This post The Next $1 Trillion Company Just Emerged… appeared first on Daily Reckoning. To date, Alphabet has made almost no effort to monetize the value of these 2 billion Android users. That lack of effort was intentional. The plan all along has been to use Android as a way to drive users to the Google search product. I’d call it a loss leader, but I don’t think it was actually losing money. Now, for the first time Alphabet will begin charging smartphone manufacturers a licensing fee to pre-install on smartphones the bundle of Gmail, YouTube, Maps, Play Store, Search and Chrome. Initially, this licensing fee will only be rolled out in Europe. Realistically, it will eventually go global because the dollars involved are enormous and because eventually monetizing Android has been the plan all along. As I noted, currently there are more than 2 billion Android devices active globally and almost 1.2 billion units are sold each year.1 The chart below shows Android sales chugging along at more than 300 million a quarter for several years now. 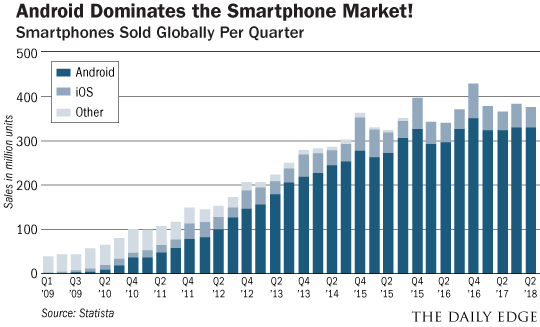 People sure do buy a lot of phones! The question we need to answer is how much Alphabet could make off of these 1.2 billion Androids being sold per year. I don’t think $15 per installation of the Gmail, YouTube, Maps, Play Store, Search and Chrome bundle is an unrealistic number relative to the total cost of a smartphone and importance of these apps. With 1.2 billion Androids sold annually at $15 per installation, we are looking at $18 billion of incremental revenue for Alphabet!! Wow. As I said, monetizing Android was in the plans all along. With the 2 billion users that Android currently has and Schmidt’s $10 per user estimate, that would result in a $20 billion revenue stream. Interestingly enough, that is almost exactly my estimate for the potential from licensing. There is big cash flow coming for Alphabet from Android, you can be sure of that. Please take a look at the chart below and appreciate it for how incredible it truly is. This chart depicts Alphabet’s annual EBITDA (earnings before taxes, depreciation, and amortization). EBITDA is basically a proxy for pre-tax cash flow. 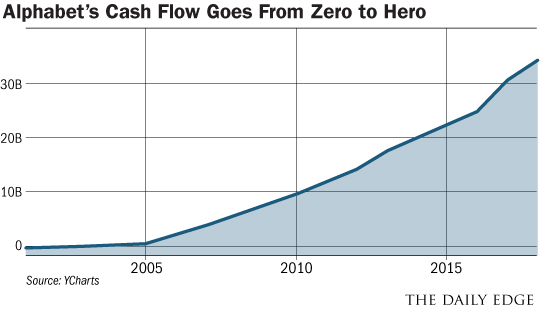 Not much more than a decade ago Alphabet was not generating any cash flow. In 2018, the number is well in excess of $30 billion. That is just staggering. While I want you to appreciate that amazing chart, what I want you to take away from it is that even for Alphabet a $20 billion increase in cash flow is a very big deal. Finally monetizing Android could increase cash flow by 65 to 70 percent and cause a similar increase in Alphabet’s share price. I certainly think it would be enough to push Alphabet’s total market valuation over $1 trillion, which is more than $350 billion higher than where it is today. I believe that makes Android the most valuable hidden asset on the planet… which is why this tech giant deserves a place in your portfolio. The post The Next $1 Trillion Company Just Emerged… appeared first on Daily Reckoning.